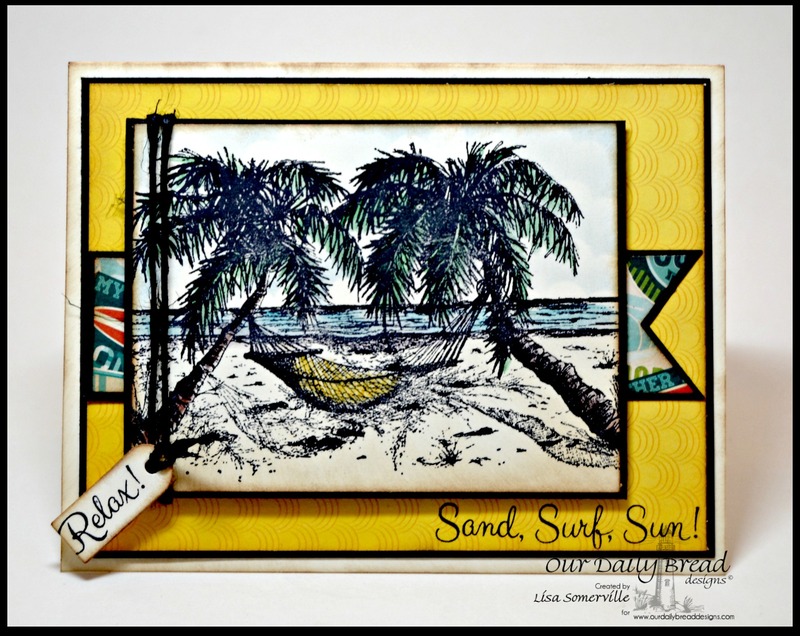 Designs by Lisa Somerville: Sand, Surf, Fun! Happy Bloggers Challenge Friday! Thanks to those who played along with the Metal Challenge, the challenge this week is Travel. Tired of the White "fluffy stuff", I decided to go to the beach using the Travel Challenge. Inspired by this sketch, I used stamps and custom dies from Our Daily Bread Designs along with Bo Bunny pattern paper. The image is from the Happy Retirement stamp set, stamped in Black Archival ink, colored with STAEDTLER Karat Aquarell Watercolor pencils. "Relax" is from the Flip Flop Fun stamp set, stamped in Black Archival on Vanilla card stock and die cut using the Mini Tags Dies. The Sand, Surf, Sun! is from the Life is Better stamp set, I also added the sentiment Life is Better in Flip Flops from this same set to the inside of the card. Love this! The beach theme is a welcome change of pace from all of this wintery weather! Cant you just feel the sand in your toes! I can, just staring at your beautiful card. I can smell the salt air, listen to the waves and hear the birds calling my name. Beautiful!